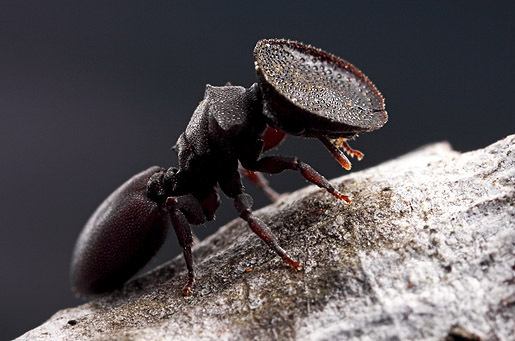 Cephalotes varians ants live in pre-existing cavities in trees and branches, so one class of their workers has developed a most unusual adaptation. Turtle ants aren't fighters. Rather, they're all about defense. If a colony gets hold of an old beetle burrow, the heavily armored majors will plug the entrance with their head shield and sit tight, budging only to let their nestmates pass. They are literally living doors. Found at Myrmecos. Elsewhere in the blog you can read about "formicophilia" (a newly named paraphilia). intriguing, how does evolution work on this case? communities that have more door-shape-headed guards are more successful so they slowly become dominant? because inside the community the selection doesn't work, on individual ant level. ant colony is actually mother ant and all other (workers) are it's limbs, antennae etc, like body parts. only mother's (and father's) genes count. Hey- Were these also on Noah's Ark...?